My name is Suzanne Higley; I live in Clearfield, Utah. I was diagnosed with Fluoroquinolone Toxicity after taking Cipro in 2012. After a recent relapse I am traveling with my family to Stemmaid for embryonic stem cell treatment in hopes of healing. The money raised will go toward the treatment and related expenses. We will be going in July and the treatment will take 5 weeks. After years of battling with relapse after relapse, this is my last hope. I am currently bed-bound, can't walk or talk, and am living on baby food and pureed soup. I am suffering from extreme pain in the front of my neck and esophagus and also from central nervous system issues. I once was a healthy, happy wife, mother and career-oriented woman who was always on the go. I enjoyed running, golf, hiking, walking, biking, cleaning, eating out at restaurants, traveling, and so many other things. I am not the same person I used to be. I have lost my independence, my career, many of my friends, hobbies, freedom. I am now 40 and cannot fathom that this is my life. I need to get better for my husband, my kids, and myself. I want to improve my quality of life so that I can take care of those that love and take care of me. Thank you for your support. Thank you to everyone who helped me get to Stemaid. I am so fortunate to have so many kind people donate. For those of you looking for an update, I will leave you with my experience thus far one month post stem cells. I have been home for a month. I had improvements at Stemaid that occurred around Week 3. My hands were moving FAST and I could talk a LOT, smile, laugh, sit up longer, and Fabrice worked with me to get my neck to move some and to get my pelvis alligned since I pulled my back out during week 3 as well. I had ESC injections in both SI joint areas and it seems to have helped a lot. Brain fog got better, I could start seeing some light and hearing sounds more, I stopped having CFS attacks, I could communicate better. I was sooo excited to come home and show people I could laugh and talk again but I boarded the plane and sat down and something pulled in my neck/throat area. It was the beginning of another flare/relapse so the healing I did with my neck, throat and hands all got wiped away. Ugh! 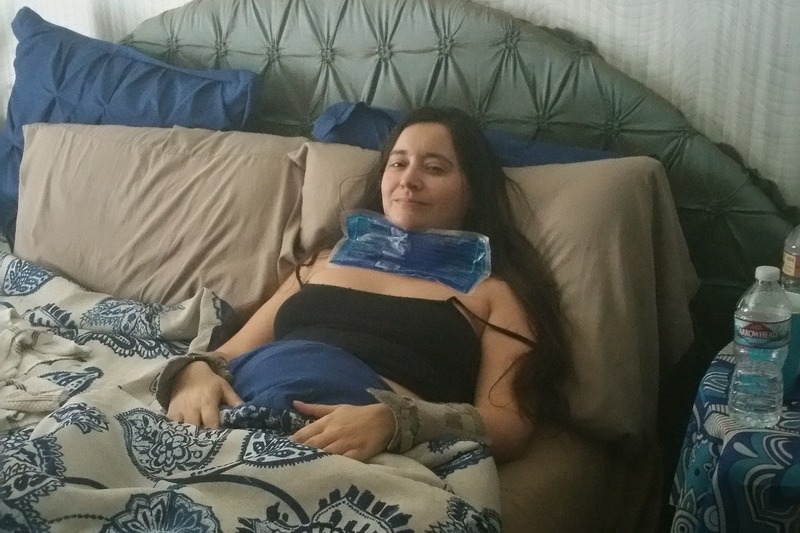 My neck and throat are worse than before and I'm basically bedridden as small movements, even swallowing my own spit pulls the tendons/muscles allowing them to tear easily. This has been a signature issue with me. Dr H. says it's the lack of collagen and that as long as I am actively floxing I cannot heal. So, I need to wait until my body stops doing this. I don't know when that will be or if I will improve enough to be able to return. I haven't had any more improvements since Week 3 which I think is a bit odd to start improving and then just stop, but once again, it's probably my relapse which is just like an acute phase of floxing unfortunately. Anyways, I wanted to give an update. Good memories for sure!